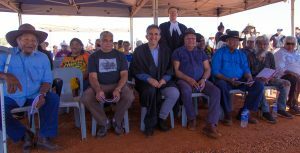 The Yinhawangka people celebrated the legal recognition of their land and culture at an on-Country Federal Court hearing at the Rocklea Pastoral Station on 18 July 2017. This Determination of Native Title comes after 20 years of robust negotiations with the State Government of Western Australia. The Determination Area embraces the townsite of Paraburdoo, the Aboriginal communities at Wakathuni and Bellary Springs, six pastoral leases, crown reserves and unallocated crown land.